Pay attention to the shaft line up so you dont make the mistake I did. Also if you have access to a micrometer mike both caps on the old u joints and the new joints to make sure the fit isnt to tight. I had to taake off 1000th off each opening on mine. Im not sure how Kubots holds tolerances. You can buy a ball hone and zap in and out once there done. On the yokes thats the u joints goes in....like I said in and out once or mic. it as .001 comes out fast. Im in the same boat you are, but after a week have had no luck finding the joints. let us know how the 397 joints work out. I went to napa and the 397 was just a bit too short cap to cap compaired to the old one, lock rings were the same though. Anyone see if the 2011 model joints fit hear they have fittings. Have you tried to heat them with a torch? The yoke were the caps go in. On cars with no clip they use melted plastic to hold the caps in.....all you have to do it heat em up and they will pop. In r case get em hot...a little red and support just 1 side so not to bend the yoke and it should move out. I have used a air chisel on the joint at the same time as you support it as I dont have 3 arms. Sometimes you have to cool off a few days come back and take a good look before you start again. I have got pissed and bent the yoke before...no big deal just heat it up and straight it out. I did that on a guys truck and they never failed on him again and he was on his 3rd set. They were bent when I got em tho is why they failed all the time. Just eye ball them up is good enough. I feel like I brought everyone bad luck on my mis adventures. The 397 joints worked fine on my 2004 Bota.Im not sure if any design changes were made since then. What Problems are you running into with the 397s? Here is the image of the 397 installed on My machine. The caps do sit a little deeper maybe 1/16 of an inch deeper but they do work. I never did get mine loose. From what Ive been told they should pop right out but you know how that goes. There used to be a product out that was called Rid Rust that worked well and I used it at work a lot. Ill have to google it and see if its available to the public.Its real good stuff and we used to to soak fittings to loosen them up after being underground for years. I have used muric acid they use for cleaning brick in a spary bottle and it will take any rust away....just don't breath the fumes....best thing I found for rust u can see it boil off then just rinse with water. A guy gave me a 454 block that was rusted...he thought it was no good....after the acid spray...and a .030 overbore I had a brand new block free. For that big project I used a 2 gallon hand pump sprayer which work great on something that big......took me 8 hours but was worth it....have used the spray bottle on small projects tho....may want to use rubber gloves in case the bottle leaks as you spray it. Man Mark u need to replace those boots before its to late. LOL Boots are in good shape so no need to replace them just yet.And yes the Zip ties work well and are a lot easier then them Damned steel straps they used. Axles with u joints removed from bumper! Maybe ill send mine to you to remove also lol. Without the press, I would have been up the creek. 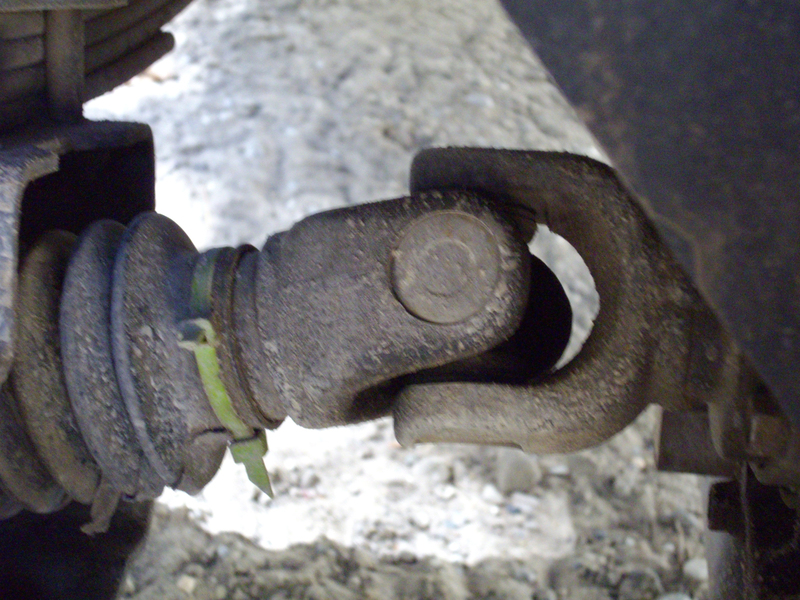 I rigged up a bearing puller to remove the outer bearing from the bumper. It has to be removed from the outside end. Here is a picture of it. Basically, it's a bolt with several washers for strength . I ran it from the inside to the outside with the bearing in the middle and placed the large green "washer" or piece of steel with a hole to fit on the outside edge of the axle. Make sure the bolt has enough thread and have a few spacers to place on the edge of the big green "washer" to give enough clearance to clear the bearing of the axle. Then just tighten up the bolt and it will pull up the bearing as it tries to tighten.I used an impact wrench and zipped it out. I also had a bearing left on the shaft that I did manually and used steel plate to form a puller on the hyd press. I included a picture of that too. You do good work. Once in, your commited to go the whole route, seals and all. I don't think I will ever have enough hours on mine to get to this condition but it is great to know there is a thread to refer to. Can't imagine what the dealer would charge for parts and labor. I bet it would send a wallet into outer space without the shuttle. This is the reason I like my shop with alot of tools. They pay for them selves time and time again. I know what was done and don't have to end up with some one elses short cut ( he will never know anyway ) version. You did leave out the language , bruises, and cuts along the way.